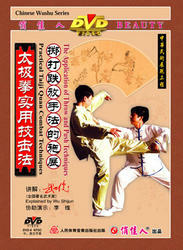 Practical Taiji Quan CombatTechniquespre important parts of Chinese Wushu, which are very useful in attack and defense. For some reason, the practice of Taiji Quan deviates from the application in real combats, making the exerciser unable to grasp the truth of this art and so many years of hard training results in the impossibility to apply. The essence of Taiji Quan is the wise use. The change of movements is nothing but the open and close, or advance and withdrawal and the victory or defeat is decided in an instant.